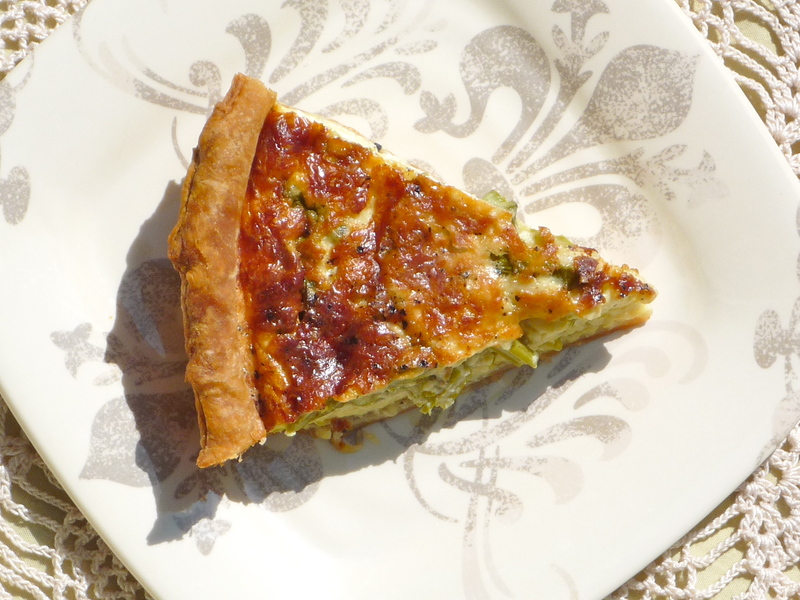 This Sunday, for Mother’s Day, our little Sunday’s with Joy group is tackling her Leek and Asparagus Quiche from the Joy the Baker Cookbook. I must admit that neither of these vegetables I have ever eaten before. I have always wanted to try leeks but I have never wanted to eat asparagus. I also must admit, that if I hadn’t been in the group, I probably wouldn’t have tried this recipe. 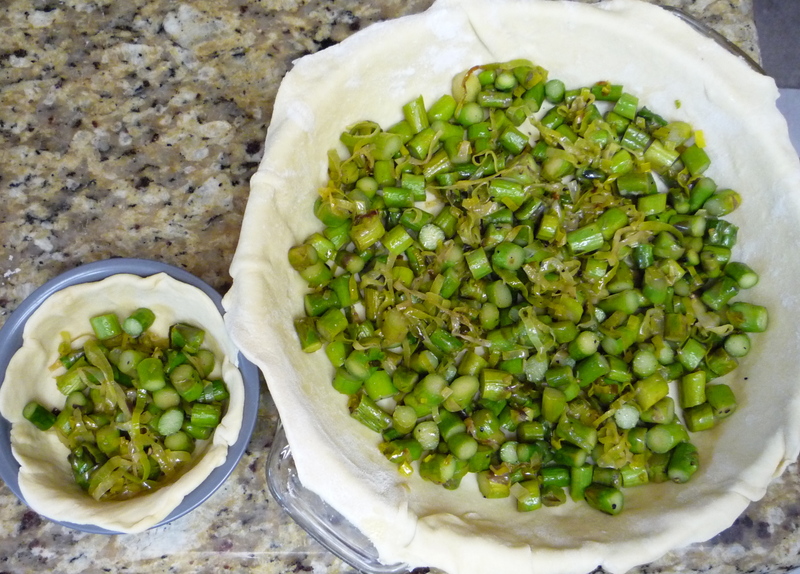 Working with the puff pastry, making a quiche in and of itself, and working with these veggies that I had never eaten before let alone worked with. 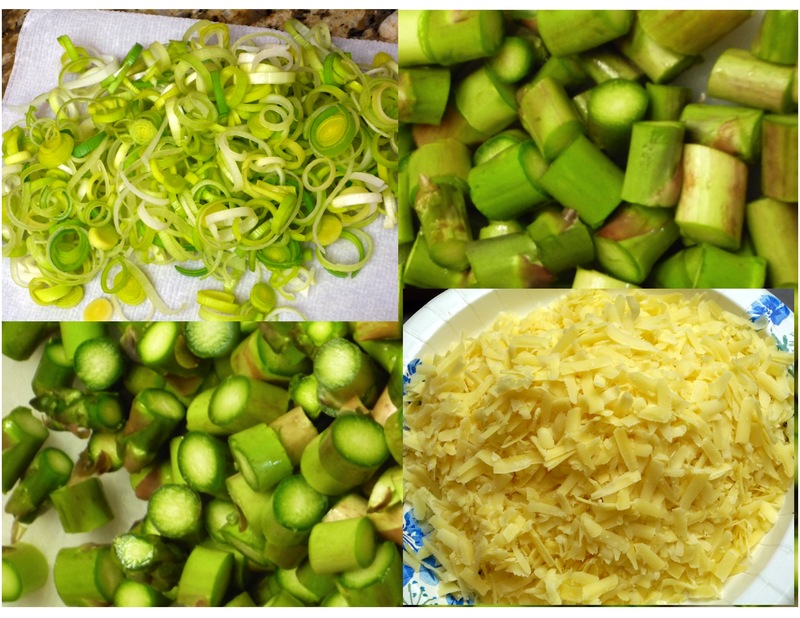 Leeks, asparagus, gruyere, O my! Well, boy o boy, was I totally off, wrong, an idiot or whatever! This was so freaking good! My storebought puff pastry didn’t puff as much as I would have liked but I do think I rolled it a bit thin. 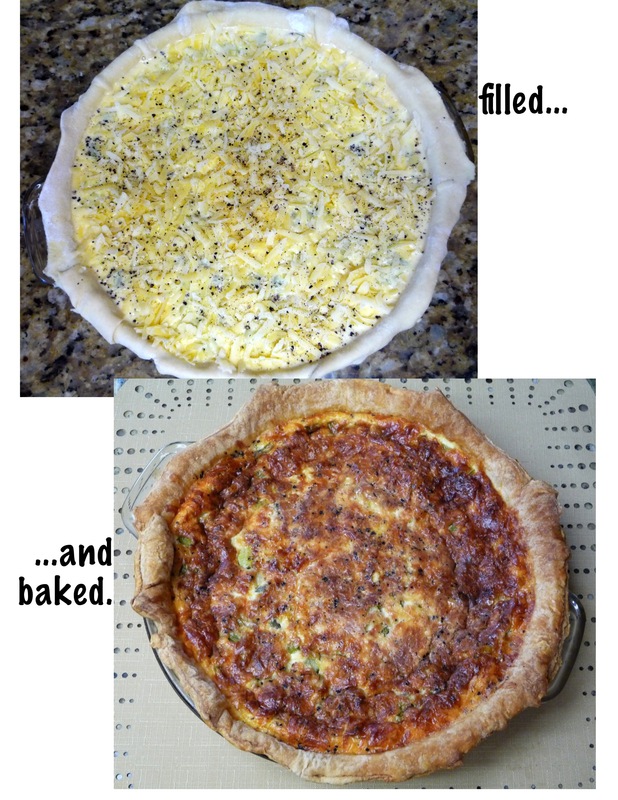 However, I was not even disappointed about that because it gave me lots of scraps to make a mini quiche that I didn’t have to wait as long to eat (you are supposed to let your quiche cool for an hour). The leeks gave a flavor as good as I thought they would be, I was surprised at how much I liked the asparagus, and the gruyere… What can I say about the gruyere? So nutty and buttery and rich. Kind of expensive but it more than made up for that in the awesomeness of this quiche (and the tomato/avocado grilled cheese that I made with the leftovers). Partners in crime, waiting for the rest of the filling. The only change I made was that I didn’t use whole milk. I used what I had on hand which was 2%. I was thinking about changing the asparagus but I am really glad I didn’t. It is not that I felt the need to absolutely follow the recipe but I felt it was more important for me to expose myself to something that I haven’t eaten before. Also before I forget, Happy Mother’s Day to all my fellow mothers out there in the blogosphere! I actually got a present this year that I know my husband put some thought into. He has been planting (food, grass, trees) all over our yard the last few months and yesterday he put in a yellow rose bush for me. Yellow roses are my favorite! We had them in our wedding and I even have one tattooed on my back (my only one). He hates giving them to me because they mean friendship but I always tell him, “Isn’t that the point? You are my friend too and that is most important.” Now he got me some that I will always have. No GeekyLink today. It has been a long weekend. 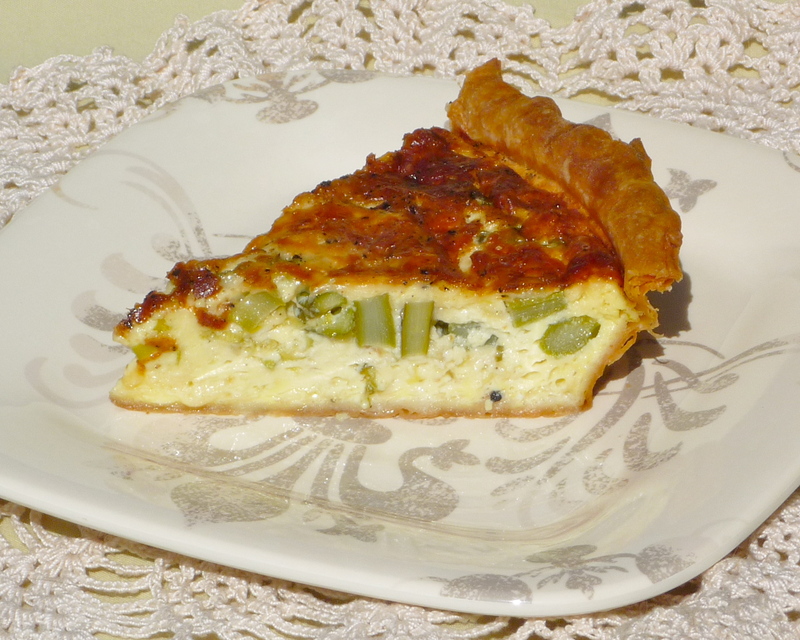 Posted in Baking, Breakfast, Family, Food, Holidays, Marriage and tagged asparagus, gruyere, leeks, Mother's Day, puff pastry, quiche. Bookmark the permalink. These beauties are for Anne Wheaton and those others that actually order tea with, “Tea, Earl Grey, hot,” in the manner of a certain Captain, and just receive a blank stare. I don’t ever order tea when I go out, but if I did, that is how I would do it. How sad that anyone might not get the reference. Speaking of the above reference, did anyone else know besides the millions of people that follow certain other people on twitter (@wilw, @levarburton, @jonathansfrakes, @brentspiner) that the entire cast of Star Trek: The Next Generation just reunited at the Calgary Comic & Entertainment Expo held less than 3 weeks ago? Now, sure, it was a big theatre, but as a huge Next Generation fan, why the heck wasn’t this thing televised or something? Of course you can pretty much watch the whole thing online here or here and OK lots of other places but it would’ve been awesome to have seen it live. I also really like this recap and this is pretty funny (make sure you scroll all the way down). No, that is not fingerprints in the batter! What are you talking about? I showed a picture from the reunion to my oldest daughter (I think it was this) and she didn’t know who the people were. *sigh* I think now is the time to begin to school her with episodes from Netflix. I remember watching the series with my mom, her favorite was The Offspring, and now I can do that with my daughter. I totally remember buying her that episode from our local Suncoast for a birthday or holiday or something (geez, I’m old). 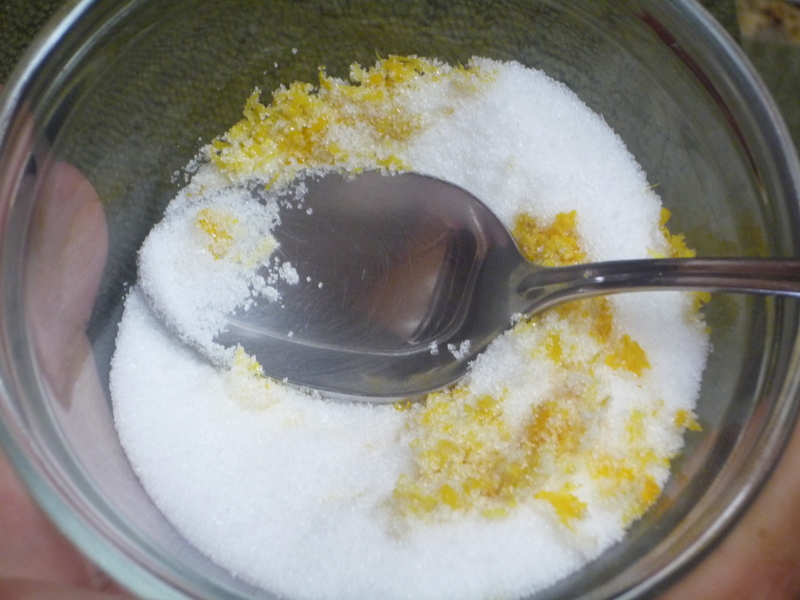 The beginnings of lemon sugar. 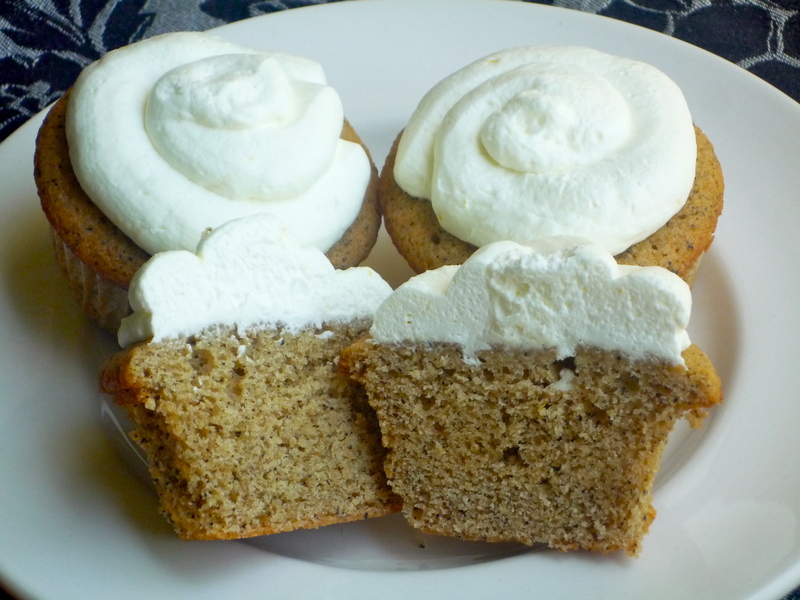 So speaking of moms and tea, I think this cupcake would be really great for a Mother’s Day Tea! 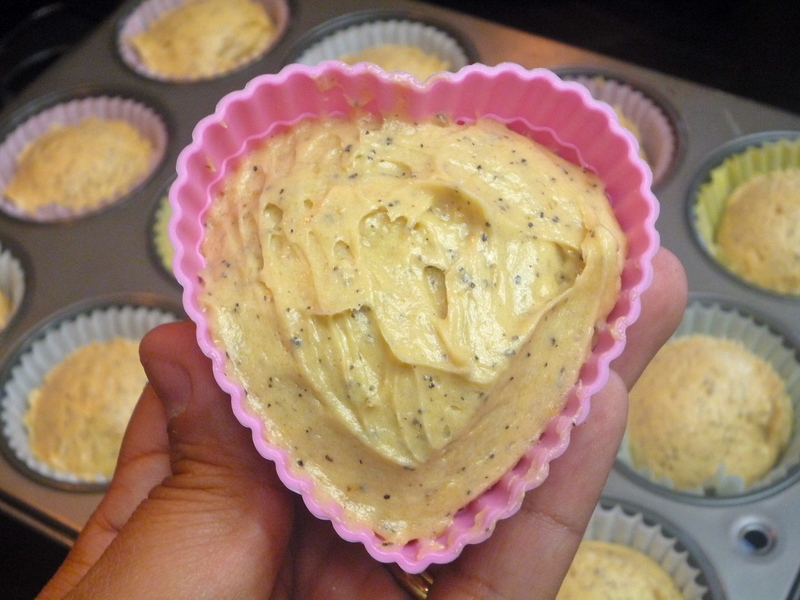 If I had to do it over again, I would make the flavor just a bit milder by using plain milk or only putting one bag worth of tea leaves in the batter instead of two but really it is to your taste. While I was eating the batter (yes, eating the batter), having used the tea steeped milk and two bags worth of tea, I thought the batter was AWESOME but after baking, I think going just a bit milder may have been better. Um, if you need another GeekyLink after the above post, I want to be your best friend. 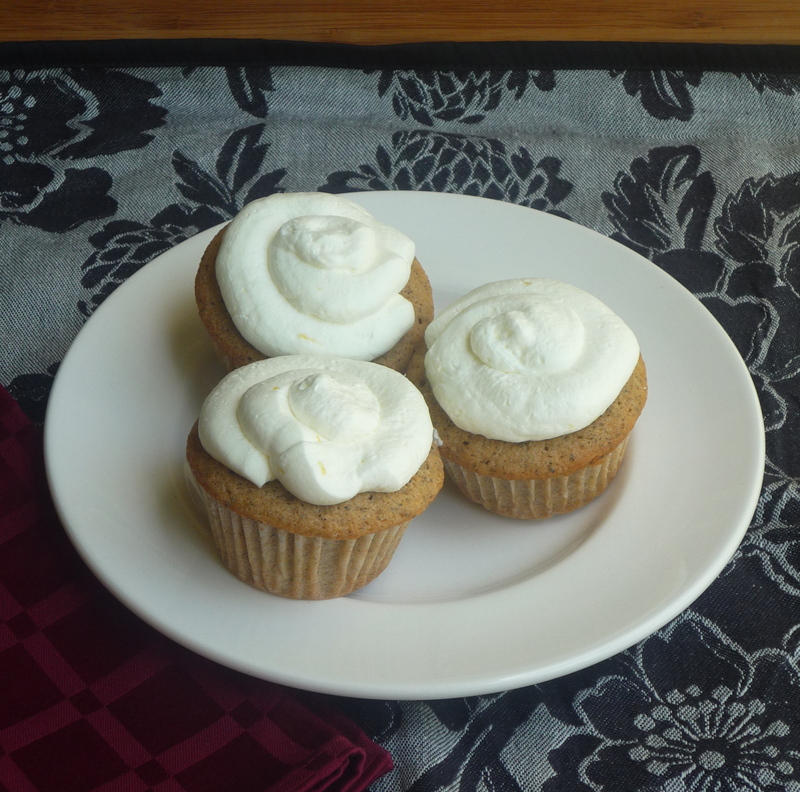 Posted in Baking, Cupcakes, Family, Food, Holidays, Parenting, Television and tagged Cupcakes, Earl Grey, Mother's Day, Star Trek: TNG. Bookmark the permalink.